Arizona assistant Tracy Duchac has stepped down from her role as an assistant after one season with the Wildcats. The newly-married coach is expecting her first child with husband Adam Slusser in December, and the pair will return to Texas where he will pursue professional opportunities as an engineer. Duchac’s coaching stock skyrocketed early in her career; she was a volunteer assistant coach with Purdue as a 5th-year senior, after completing her eligibility, and was part of the Boilermakers’ run to one of the most successful seasons in school history. She was then snapped up by Texas A&M and coach Steve Bultman as his chief assistant with the Aggies, where that team became a powerhouse and perennial top-10 team. Last season, when Eric Hansen took over the reigns at Arizona, he brought in Duchac to fill one of his assistant roles. Hansen came from Wisconsin, and with Duchac being a Wisconsin native and a former Big Ten athlete herself, there was a bit of familiarity there. Duchac is best-known for her work with sprinters, which fits her skills as a swimmer (she was the first Purdue woman ever under 23 seconds in the 50 free). This job, along with assistant coaching positions at Ohio State and Stanford, plus the head coaching job for the Stanford women, are the biggest jobs still on the market, so expect quite a few more dominoes to fall. This late in the season, after most programs have started practice, some of these gigs may be filled from the club ranks as well. There was some confusion earlier this summer after former Cal All-American Deborah Roth confirmed to us that she would be transferring to Arizona. We have received confirmation from sources close to the program that Roth is, in fact, enrolled in classes at Arizona, but will sit out a year before competing for the Wildcats. That will suit the program just fine, as they will have a much bigger need for a backstroker next season than they will this season, with Lauren Smart having one more year. i don’t like to be sexist, but this is why women shouldn’t have to be given a spot on every team’s roster. how many female coaches have stayed in the sport while raising a family? not very many! i have nothing against women or women coaches or raising a family, but just not in support that programs HAVE to hire a less qualified woman over a male coach. As a male coach looking for a job ….tell me about it! Perhaps we should examine how much coaching talent we lose this way. We need to come up with solutions that recruit and retain talented female coaches. I’ll bet A&M’s recent successes had a lot to do with Tracy. I also bet Steve Boltman and Eric Hansen would say they did not hire a less qualified coach when choosing Tracy, it just seems unfair to judge the situation when you don’t really know the full story behind it. I do not argue there a lot more males interested in coaching but there are also a lot more male positions available. Arizona did not have a female on staff while Frank was there so I don’t think Eric was forced to fill a ‘one woman on deck’ quota…. 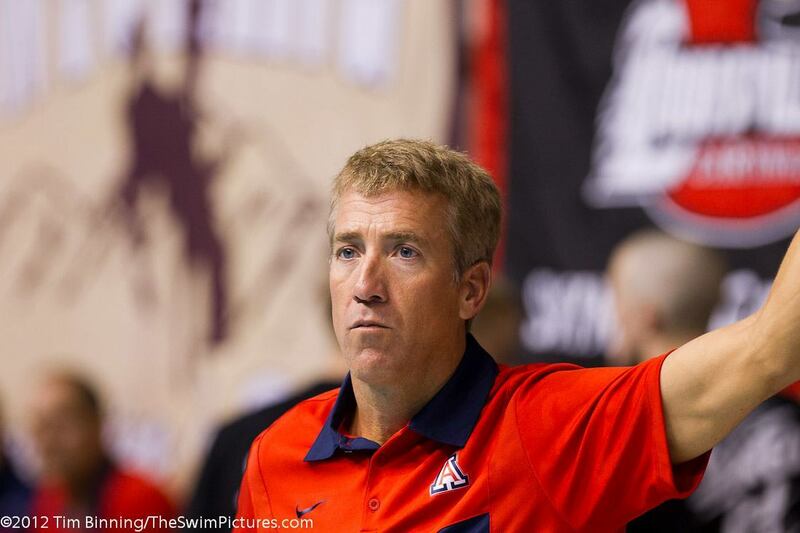 Arizona had a female diving coach all those years. I agree with Chris, if they have to hire a female coach, let’s see how we can maintain them in the coaching ranks. Jeanne Brophy was an assistant for Frank at Arizona. She spent at least 5 seasons with the Wildcats. It seems like everyone is leaving…. Always turnover in swimmers with a new coach. Quite a few going that way too, for whatever that’s worth. Will have to see how it all shakes out.